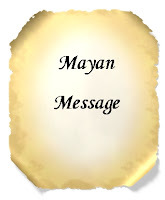 According to Engineer Rodolfo Garrido Cotham, an expert in the study of the Mayan culture, the principle message of the Mayans is the revealing meeting of the individual with himself, face to face, the time in which humanity will enter the great hall of mirrors, during a 20 period cycle until 2012. It is then time to wake your conscience to understand the good, getting rid of what doesn't work anymore. Of everything negative that surrounds you, to wake in the collective consciousness of love, bringing forth the cosmic race in harmony with itself, with the earth and the cosmos, with respect to the sun, since for the Mayans the sun is the connection to the creator. The people on earth that refuse to comply will find it impossible to live in the era of the sixth sun, for it will be the universe that will connect to mankind. According to the Mayans 1st prophecy, human life based on economic strife with fear of holding onto jobs, money or valuable objects, or the desire to be an important person, tin muscular and "beautiful" to find the "so called true love", has to end by 2012, since all of this is based on fear. The human race will be faced with a choice to either disappear or evolve waking up to conscience, so as to incorporate itself to the marmonic cycle of the universe. 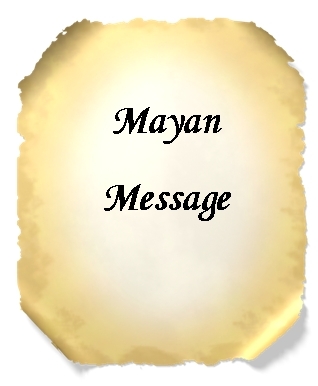 The Mayans also knew that the sun was alive and at some point synchronised with the centre of the Galaxy provoking increments in its activity (scientifically named solr eruptions and magnetic changes). They said this phenomenon would happen every 5125 years, thus affecting the earth by changing its rotating axis.